Young played his first two pro seasons with the Los Angeles Express of the USFL and joined the NFL’s Tampa Bay Buccaneers, who had picked him in the first round of the 1984 supplemental draft, for the ’85 season and appeared in five games. Traded to the 49ers following the 1986 season, he primarily backed up Joe Montana for four years until taking over as starting QB in 1991, when he led the NFL in passing (101.8 rating) and yards per attempt (9.0). He followed up in ’92 by leading the league in passing again (107.0 rating) as well as completion percentage (66.7), yards per attempt (8.6), and TD passes (25) and was a consensus first-team All-NFL and Pro Bowl selection, also receiving MVP recognition. He passed for 4023 yards in ’93, led the league in passing for the third straight year (101.5 rating) and was again a first-team All-NFL and Pro Bowl choice. 49ers went 13-3 to win NFC West and gain the top playoff seed in the conference while leading the NFL in scoring (505 points) and touchdowns (66) and placing second in total yards (6060). Won NFC Divisional playoff over Chicago Bears (44-15), NFC Championship over Dallas Cowboys (38-28), and Super Bowl over San Diego Chargers (49-26). Young played four more full seasons with 49ers before his career ended three games into the 1999 season, after suffering a third concussion in four years. He was selected to the next four consecutive Pro Bowls, for a total of seven altogether, and led the league in passing twice more. Young retired with the highest career passer rating in NFL history (96.8) and second most rushing yards by a quarterback (4239). Along the way, he threw for 33,124 yards and 232 touchdowns in the NFL in addition to 4102 yards and 16 TDs in the USFL where he additionally ran for 883 yards. 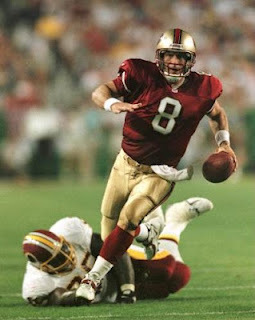 Young’s #8 was retired by the 49ers and he was inducted into the Pro Football Hall of Fame, Class of 2005.